PLEASE NOTE: Warranty cases will be handled directly through the manufacturer and NOT Airsoft GI / GI Tactical. "Troy Industries was founded on the principle of making reliable, innovative products that will function without question when lives are on the line. All of our products are American made and designed to perform flawlessly under intense battle conditions. Troy Industries is the choice of Special Ops, Law Enforcement and War Fighters worldwide. We are honored to have the trust and support of law enforcement and military personnel." "Troy Industries is a leading United States Government contractor that designs and manufactures innovative, top quality small arms components & accessories and complete weapon upgrades. Our products set the industry standard for quality and durability. Many iconic firearms manufacturers incorporate Troy products into their finest new weapons, among them are Smith & Wesson, Sturm Ruger & Company, Viking Tactics, POF-USA, LaRue Tactical, LWRC International, Noveske, and HK Defense. Troy is one of the largest suppliers of OEM small arms accessories in the United States. Troy Industries, Inc."
"Lifetime Guarantee - All Troy Industries, Inc. products are manufactured in the USA from the finest quality materials. You can expect a lifetime of trouble-free use from all Troy Industries, Inc. products from our Battle Ready Series to our accessories line. All Troy products are warranted against defects in material and workmanship. The warranty is limited to replacement of the failed/damaged part with the same quality components. The determination of whether or not a product will be repaired or replaced under this warranty will be on a case-by-case basis and at the sole discretion of Troy Industries, Inc. This guarantee only applies to the original purchaser. This warranty is in lieu of all other warranties, expressed or implied. Remember, we stand behind our products. When you purchase a Troy product, you have my personal assurance of its integrity and that it exceeds the highest possible standards and levels of quality control." "After all, my name is on everything we make." Troy's new SDMR Rail installs quickly and easily. The streamlined one-piece design is exceptionally lightweight and sleek. With its series of keyholes, accessory mounting is simple and reliable: they can't loosen or fall off. 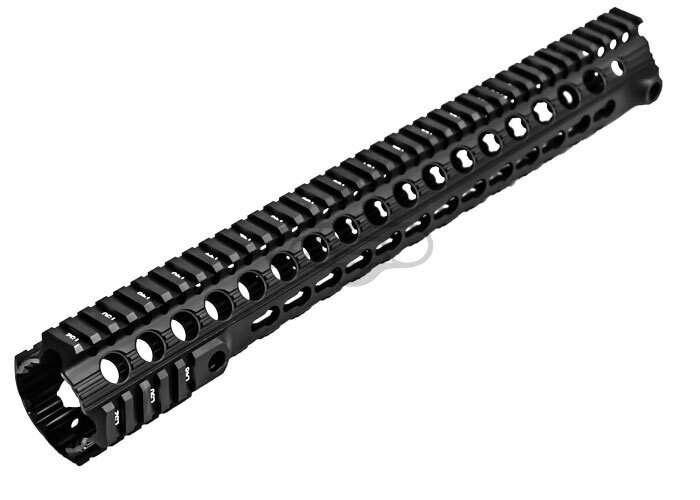 Machined from hardened aircraft aluminum with stainless steel components and finished in MIL-SPEC hardcoat anodizing. Will mount on standard AR mil-spec barrel nut. how could i put this on a kwa lm4?